A popular party theme for any age, a Pink and gold birthday party is fun, girly and there are tons of great ideas right here to make your event memorable! For a little princess and her parents, turning one is a pretty big deal. It’s not every day that your little darling gets to celebrate her first birthday. And that’s why it’s only natural that you choose the best theme to help you celebrate this milestone. If you’re not into character themes, this pink and gold birthday party is perfect for your little one’s big event. Get fun ideas for personalized table centerpieces, party favors, desserts, decorations, birthday cakes, and more! Why a pink and gold birthday party? Well for starters, a pink and gold party theme is one of the most popular party ideas for girls. Because it’s sophisticated yet sweet, a pink and gold birthday party is something that you and your guests will remember for a very long time. 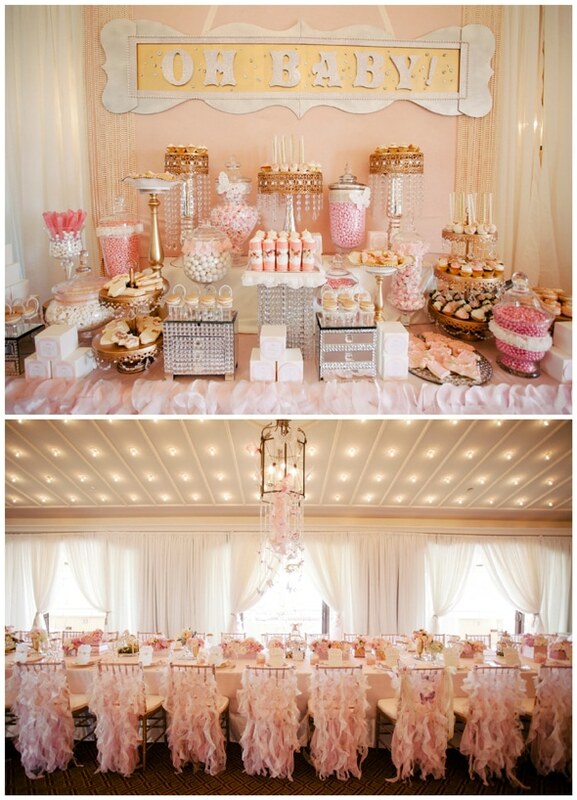 Why not throw the most gorgeous and girly pink and gold birthday party?! We know how overwhelming it can get when organizing a party – especially a first birthday party! While throwing a first birthday party can seem overwhelming, with a little planning and preparation (as well as a little help from us! ), you’re sure to enjoy this celebration as much as your loved ones and guests. To help you out, we’ve picked the most adorable pink and gold party ideas that you’re sure to love! From birthday balloons to party favors, you’ll never run out of inspiration with these helpful ideas. 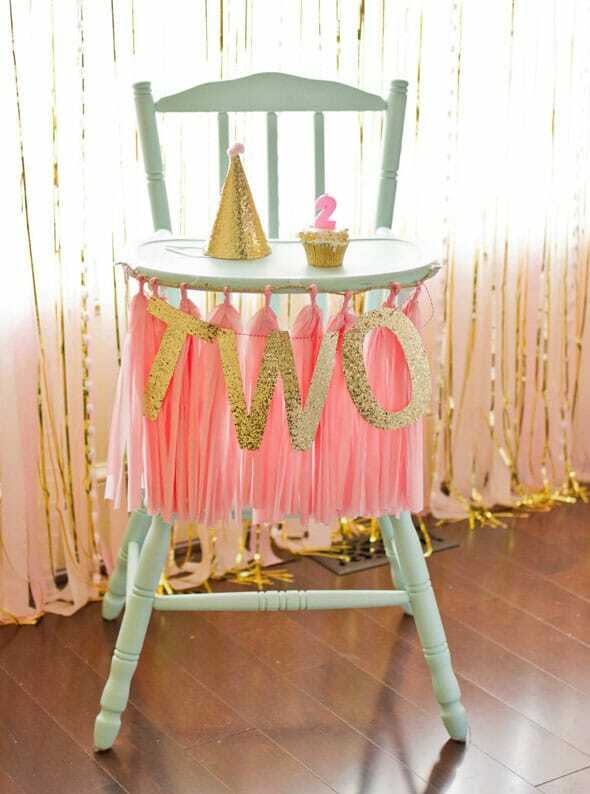 Here are 21 Pink and Gold First Birthday Party Ideas that are perfect for celebrating the little princess in your life. As a mom, one of the biggest milestones that you’ll celebrate with your daughter is her first birthday party. And we know how stressful things can be when planning that momentous occasion. Before you start fidgeting and panicking, take a deep breath and relax! We will make your planning easier with our curated list of lovely pink and gold party ideas. You will find creative ideas from pink and gold centerpieces to desserts, pink and gold decor and more! If you love crafting, you might want to try this! 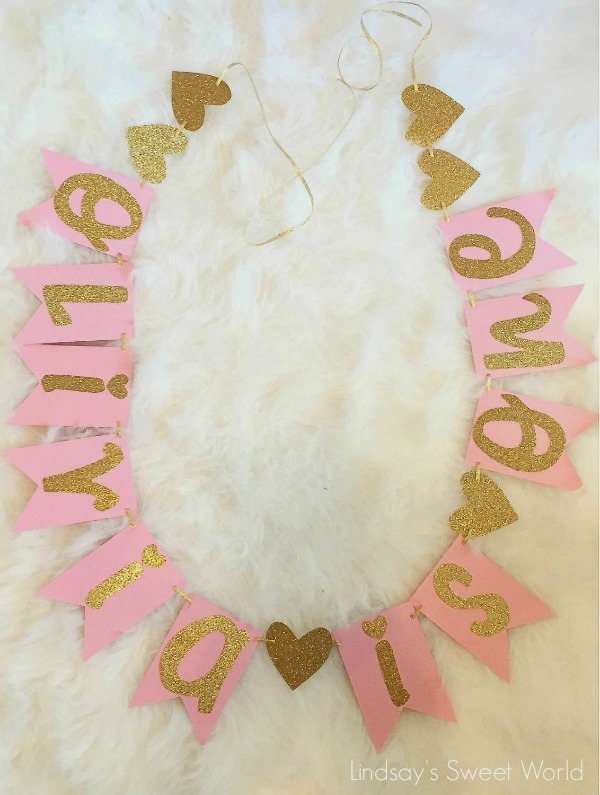 This adorable Pink and Gold One Banner by Lindsay’s Sweet World is the perfect party decoration for a pink and gold first birthday party! The gold glitter letters and hearts are perfect for this girly party theme! Is there anything cuter than this Pink and Gold High Chair Banner. This number banner is easy to craft yourself and can be used for any child’s age. We love the pink tassel banner with the gold glitter banner on the high chair! 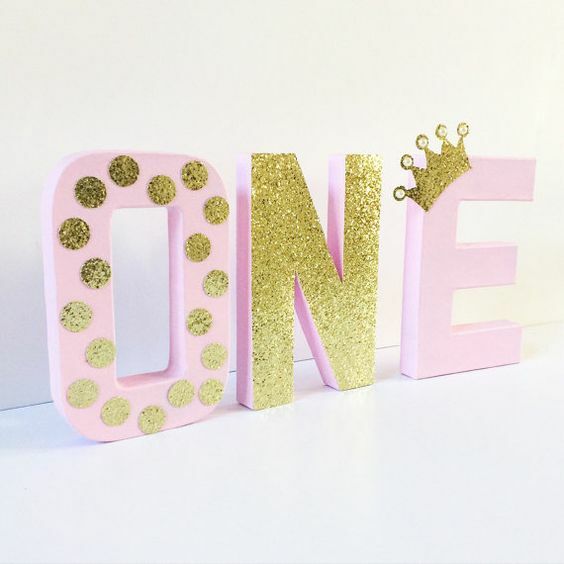 It’s an easy decoration anyone can do for a pink and gold first birthday party. This elegant Pink and Gold Dessert Bar by DessArt Designs via Pretty My Party is sure to delight your guests. Just look at the exquisite pink and gold centerpieces and all the amazing details. This would also be perfect if you’re after a pink and gold princess party or a pink and gold baby shower! Love flowers? Have a look at this lovely Floral Number Party Decor. This pink party decoration would look amazing on your cake or gifts table. There’s nothing more beautiful or girly than pink peonies, roses and ranunculus. What a gorgeous DIY party decoration! These Pink Strawberry Wafers Dipped in White Chocolate With Gold Sprinkles are absolutely delicious and super easy to make. You don’t have to have elaborate desserts at your party to make an impact. 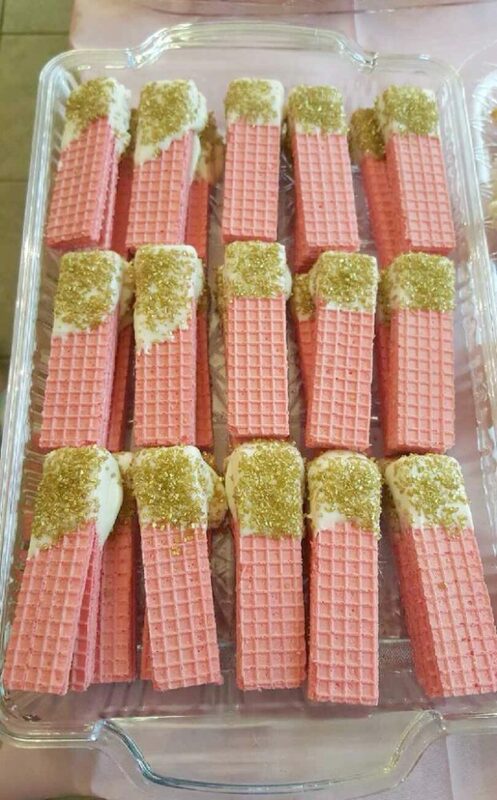 Something as simple as these dipped wafers will be a hit with the kids and are the perfect sweet treat for a pink and gold birthday party! 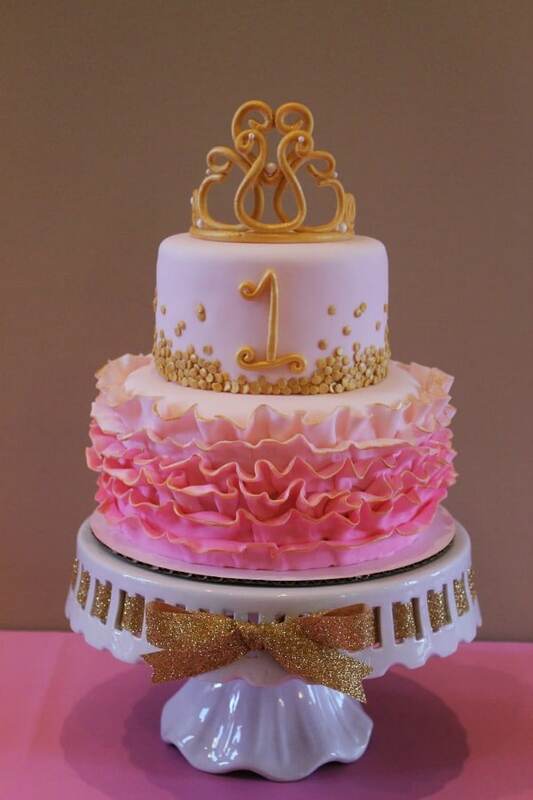 This Pink and Gold 1st Birthday Cake from Richly Blessed is perfect if you’re planning a pink and gold princess party. Topped with a gold princess crown, this cake is perfectly royal for any birthday princess whose favorite color is pink! 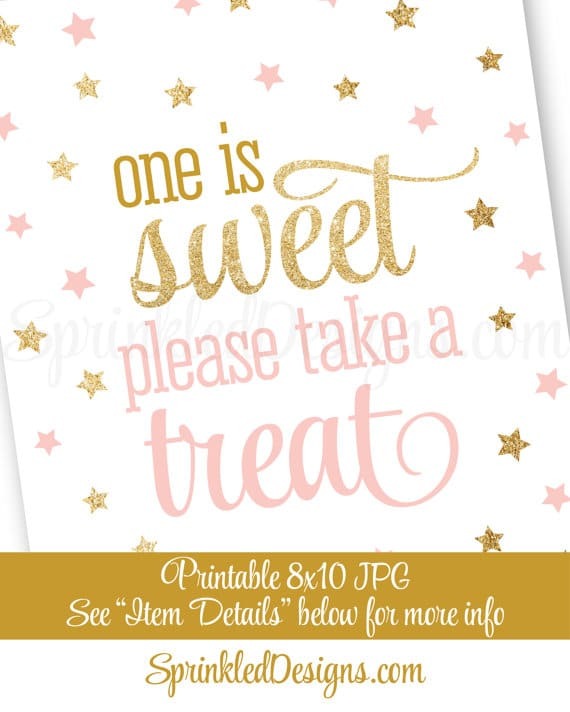 Have a look at this adorable One Is Sweet Birthday Sign by SprinkledDesign. This is the perfect sign to place at your party favors table. 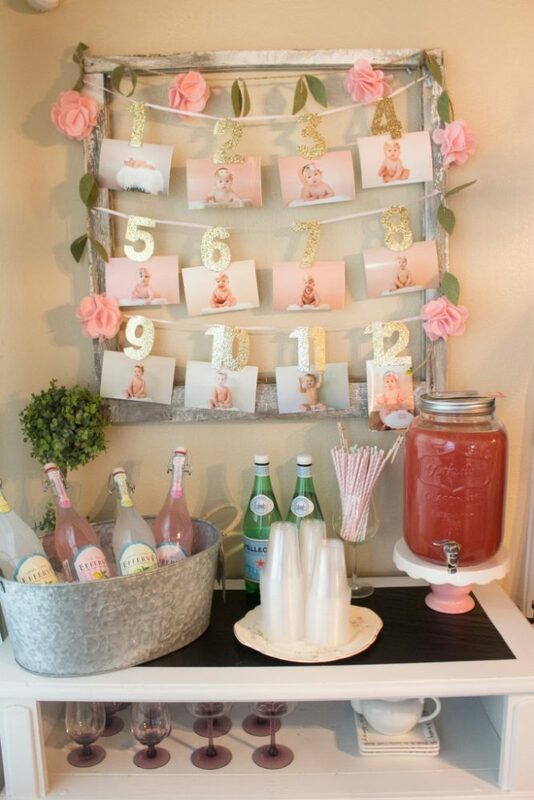 It’s little details like this that will have your guests complimenting you on your party planning. It’s all about the pink and gold party decorations! 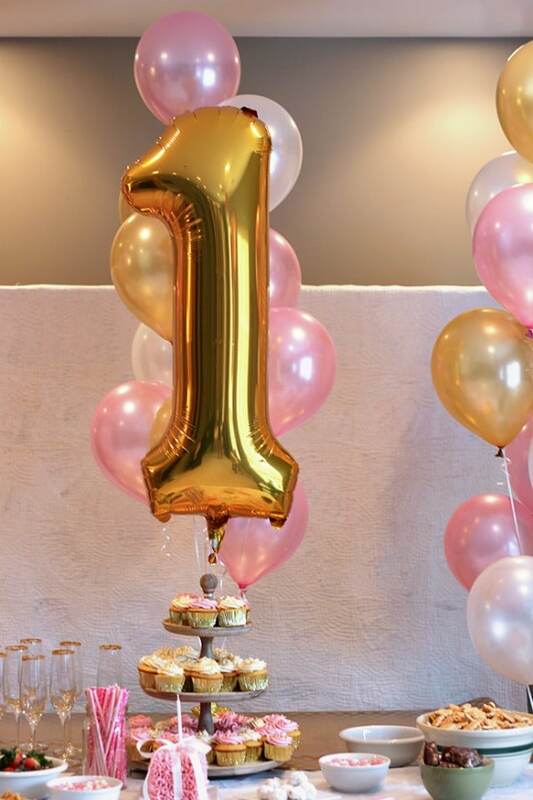 Everyone is sure to notice this cute Giant Gold Number Balloon from Bubbly and Bean. Balloons, especially the jumbo balloons, really make a statement at any party. 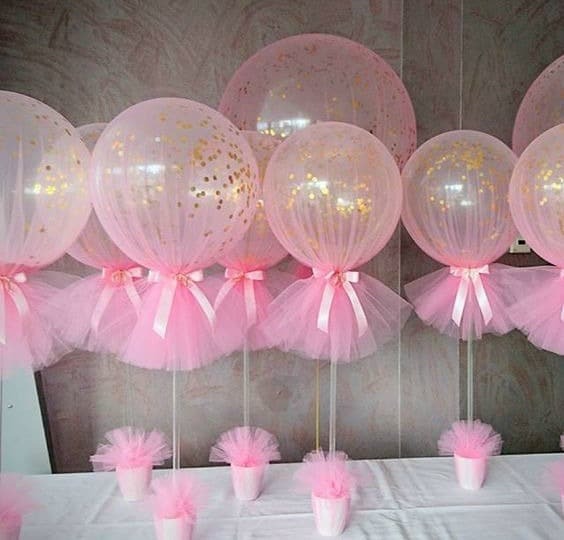 Speaking of balloons, bring in the WOW factor with these dreamy Pink and Gold Confetti and Tulle Balloons by Boutique Balloons Melbourne. They will look beautiful as a backdrop for your pink and gold birthday cake or as table centerpieces. They are super easy to make if you’re feeling a little crafty with your party. Looking for the perfect favors that will go great with your pink and gold birthday party? 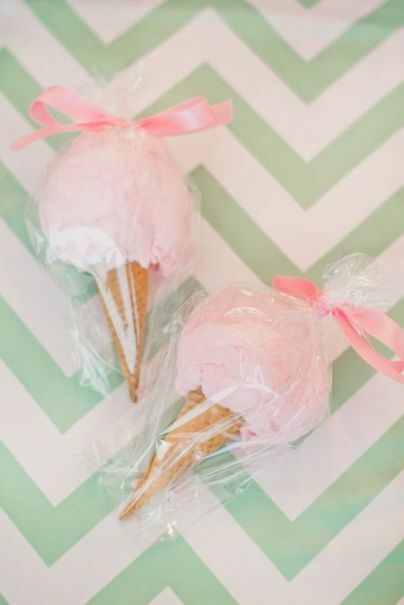 How about these Pink Cotton Candy Cone Party Favors with adorable bows from Sowen Photography?! The kids will love getting these at the end of the party. I mean, what kid doesn’t love cotton candy?! If you’re looking for something that’s quite easy to DIY, check out this Pink and Gold Party Dessert Table from Sunshine Parties via Pretty My Party. Pink and gold circles are used as a simple yet pretty backdrop idea. We love how cute and girly everything looks with pretty flower details on the party printables. Since your little one’s first birthday is such a big milestone, she definitely needs to look super adorable for her big day!That’s why when we saw this adorable Pink and Gold 1st birthday tutu outfit from ChealseaRoseBaby, we had to share it! 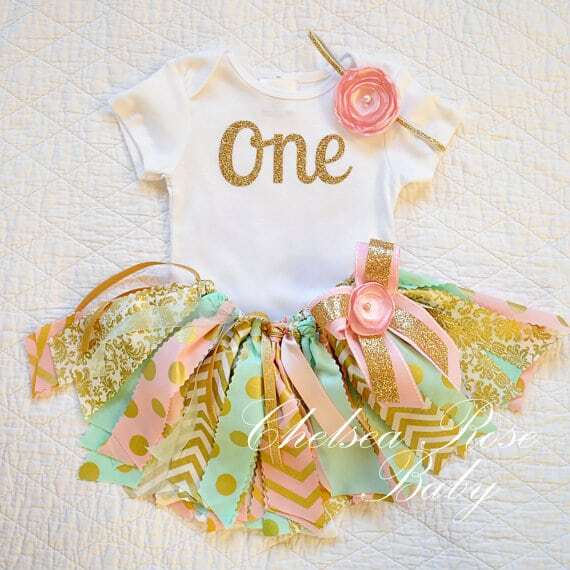 Imagine your little girl’s 1st birthday photos in this adorable birthday outfit! There are so many fun, crafty party decorations for a pink and gold birthday party. This gold glitter number 1 decoration is perfect for this theme. If you’re not the crafty type, you’re in luck because your can purchase one from Designs By Dazey. If you’re looking for pink and gold party treats, these Pink Dipped No. 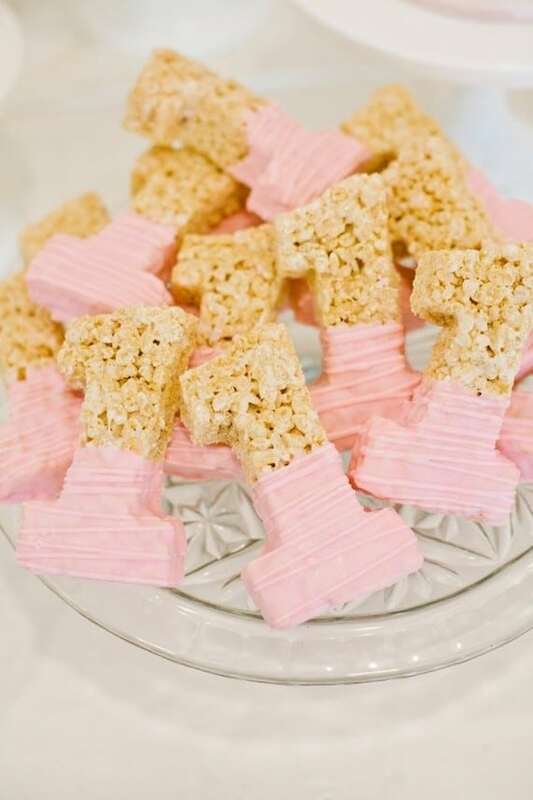 1 Rice Krispie Treats from Megan Welker via 100 Layer Cakelet are just what you need at your pink and gold birthday party! These yummy treats will also make the perfect party favor. Just wrap them individually, add a pink bow and a thank you tag. The kids will love it! This One Day, One Year First Birthday Photo Idea by Maison de Pax will make you and your loved ones smile for years to come. You can also combine pink and gold flower decorations to compliment your party theme. 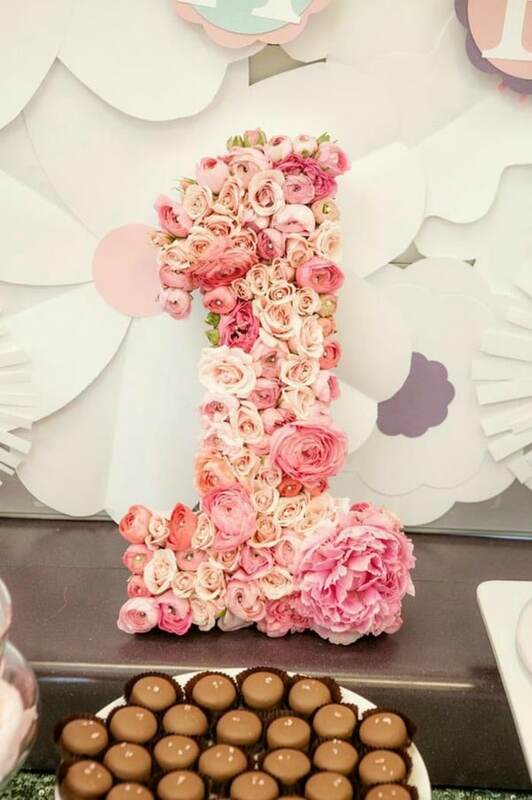 What a wonderful keepsake and great personalized party decoration for a first birthday! Everyone will be taking photos of the special birthday girl in this decorated Pink and Gold High Chair from Richly Blessed. 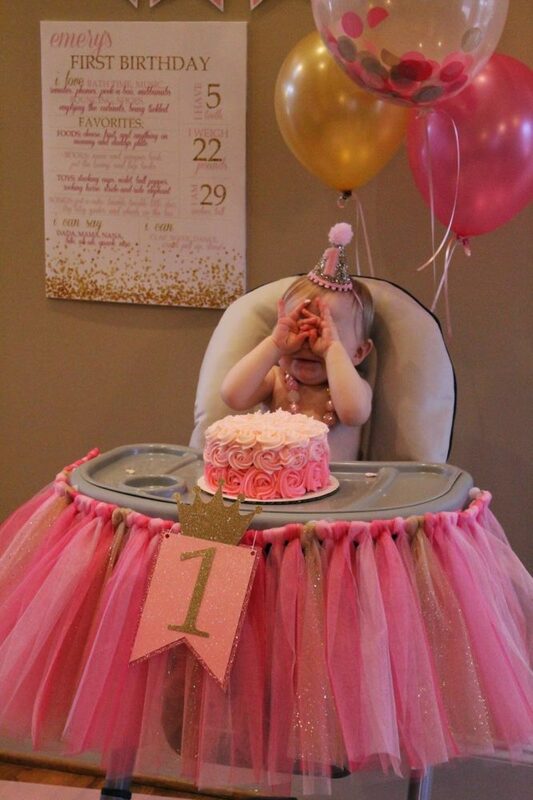 We just adore the pink sparkly tutu high chair banner with a number one decoration. How adorable for a pretty princess! 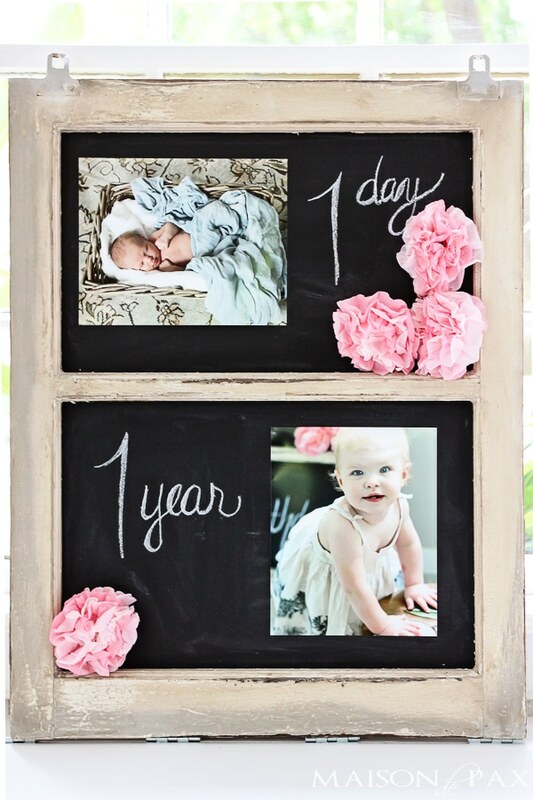 This Pink and Gold Baby’s First Year Photo Banner by At Home With Kristyn Cole is for keeps! You can also use this as a backdrop for your dessert table. Then when the party is done, you can keep this as a nursery decoration or a first birthday keepsake. The one thing we really love about birthday parties is making it your own with DIYs and personalized party decorations. 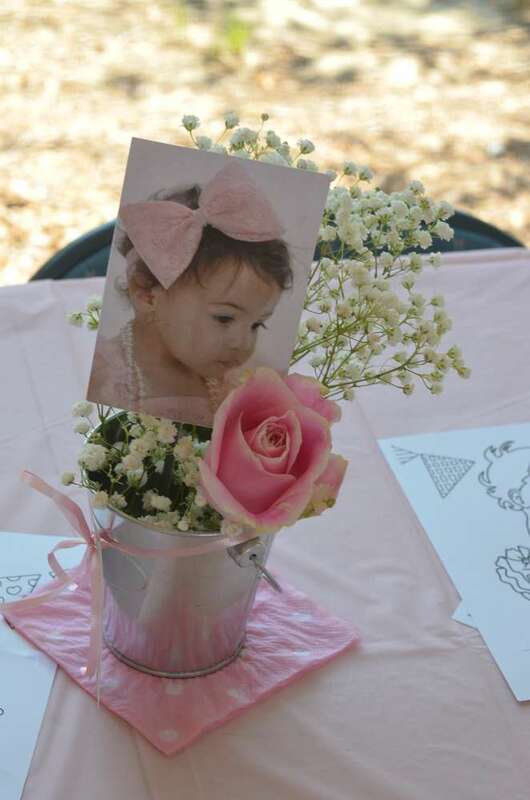 This DIY Photo Table Centerpiece Idea by Erica R. via Catch My Party is a wonderful way to make your daughter’s first birthday all about her. We love personal details like this that are easy to put together. If you want something that’s unique and elegant, check out this DIY First Birthday Party Decoration from Craftytude. Put it on the dessert table, buffet table or gift table as a perfect party decoration for a pink and gold birthday party. Your sweet birthday girl will dig right into this fabulous Pink and Gold Smash Cake from Chickabug. Pair it with a gold ‘one’ sign for her high chair and you’re all set to sing Happy Birthday! How adorable are these pink and gold shoes? 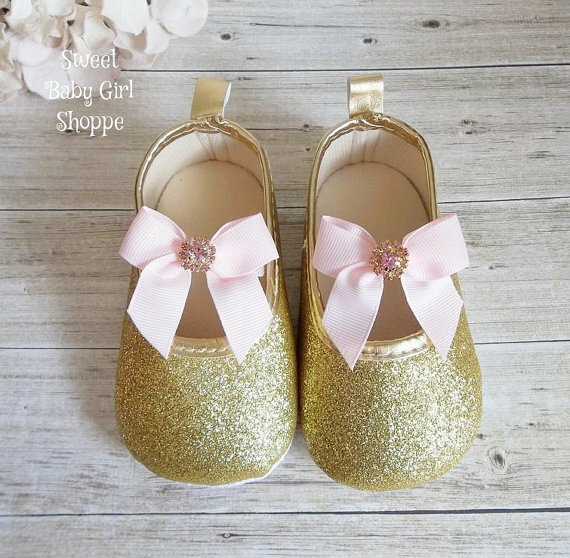 Your little girl will sparkle like the princess that she is when she wears these party shoes from Sweet Baby Girl Shoppe. 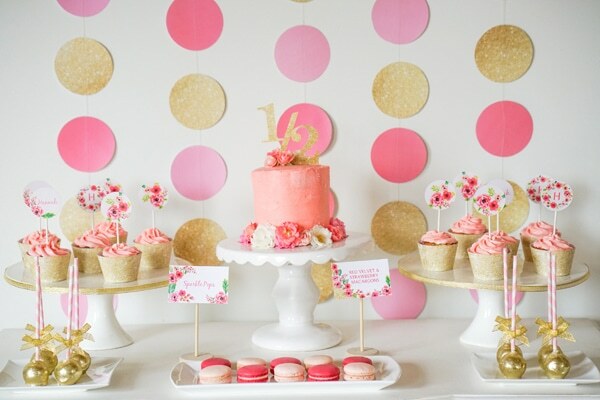 And there you have it – our 21 pink and gold first birthday party ideas. These ideas are not just for first birthdays. Some of them are also perfect for celebrating your daughter’s 2nd, 3rd, or even her 4th birthday party! 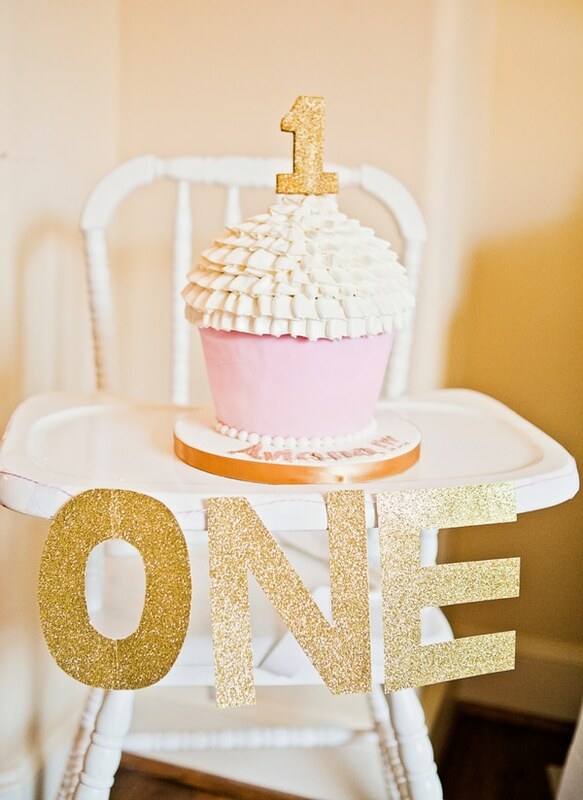 So which pink and gold first birthday party ideas do you love here? Let us know in the comments below! For more fabulous party ideas, follow us on Instagram @prettymyparty and Pinterest and join us in our private Facebook group. Anytime Linda! Thanks for stopping by!